International Women's Day is a global celebration of the economic, political, social and cultural achievements of women. It's a day to stand together and celebrate the movers and shakers while empowering the future leaders. On Thursday, March 7th, the University of Windsor EPICentre will be hosting an International Women's Day panel discussion at Waters Edge Event Centre. 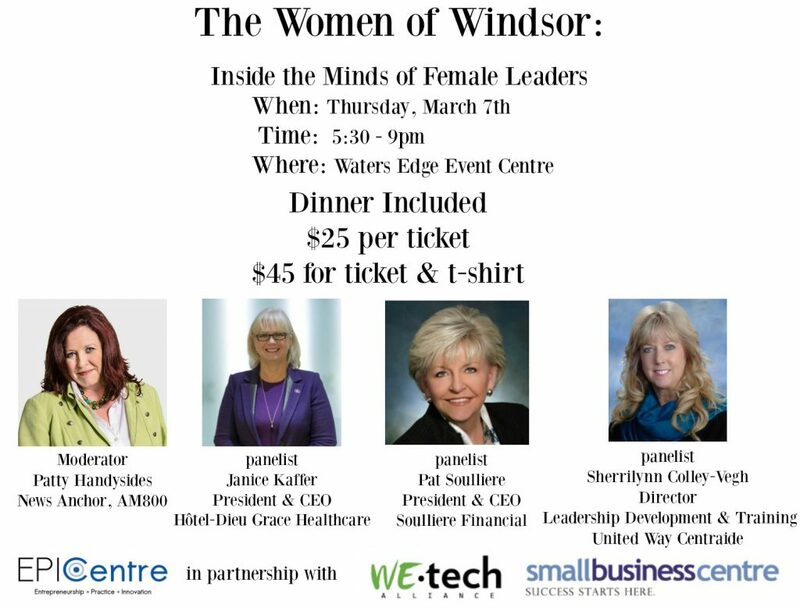 The evening will feature a seated dinner followed by a panel discussion with some of Windsor's fearless female leaders and finally a question and answer period from our audience. We hope you can join us for this empowering, inspiring evening. Janice has been serving as the Chief Executive Officer and President of Hôtel-Dieu Grace Healthcare, in Windsor since 2014. In this role, Janice provides executive leadership to an organization with a 130-year history of service to the Windsor Ontario community. Along with the more than 1,100 staff employed at Hôtel-Dieu Grace Healthcare, Janice and her team are engaged in realizing a vision for a healthier community that is inclusive of everyone with a particular focus on those who are vulnerable and/or marginalized. Janice is an alumnus of three post-secondary institutions; Centennial College, Trent University and Queen’s University and has ben a proud Registered Nurse for more than 33 years throughout Ontario and Nova Scotia. Janice draws her strength and inspiration from her friends, her colleagues and particularly from her family. She is Amma to her three grandchildren; Allison, Nathan, and Courtney, who have taught her that it’s ok to colour outside the lines. Sherrilynn is an award-winning Leadership Consultant and Artist Manager. She is currently the Director of Leadership Development & Training at United Way and Manager/Public Relations Consultant for local artists/musicians. As Director of Leadership Windsor Essex, she chaired the inaugural 40 Leaders Under 40 Awards Event. Sherrilynn is an entrepreneur and retired Principal and Chief Communications Officer for the Catholic School Board with over 30 years’ experience as an Educator, Administrator, Speaker and Community Leader. She has developed and taught Leadership Programs and Administrator Qualification Programs for school boards, universities and the International Baccalaureate Organization. Sherrilynn is the Leadership Columnist and photojournalist for Biz X International Magazine, and a Leadership Consultant with the Venture Success team at WeTech Alliance a Regional Technology Innovation Center. She has a Masters in Administrative Leadership from Wayne State University, three degrees from the University of Windsor and University of Western Ontario and she has studied music management at the Detroit Institute of Music. Her passion is travelling to over 50 countries for business, education and service and she is an active volunteer in the community representing numerous Boards/Organizations including Chair of 40 Leaders Under 40, Board of Director of Build A Dream, Rotary 1918, Women of Windsor in Business, Women’s Economic Forum, Women of Windsor and Women Leading the Way-United Way. Some of her awards include the prestigious Athena Award (Athena Foundation/Windsor Essex Chamber of Commerce-Business Excellence Awards), 20 Women of Impact Award, Odette Community Leader Award - University of Windsor, Leadership Windsor-Essex Alumni of Distinction Award, Women of Windsor 2018 and the Gloria Nane Award for Journalism and Service. From early youth, Patricia Soulliere, President & CEO of Soulliere Financial, was motivated and determined. Her professional life started when she set up a paper-route empire, taking on several routes and pressing siblings and friends to help. As a young woman, she co-founded and worked long hours to establish a successful company. Suddenly faced with the reality of becoming a single mom of four young children with no resources, Pat had to start over and find a new direction. This is when a hard-working and dedicated insurance agent was born. In 1978 she founded Soulliere Financial, later adding an Investment division and then a Group Benefits division. Pat lost the love of her life, her husband Bob LeBlanc this past November. Together they have six beautiful and successful children, seven grandchildren, and seven great-grandchildren. She continues her passion for her work, striving to maintain that balance of providing excellence to her clients and love and attention to her family. Soulliere was the first female member of the Roseland Rotary Club and inspired other women to join and participate. Today the club membership is made up of 65% women who are focused and goal-oriented in their contributions to their community. In 2018 Pat was recognized with the Athena Award by the Windsor Chamber of Commerce. Giving back is important to Pat. Her community involvement includes Benefactor and Paul Harris Rotarian, Past President Rotary Club of Windsor Roseland, Board Member and Past Chair Windsor Essex County Development Commission, Member Board of Governors for University of Windsor, Past Board member Conference Advanced Life Underwriters, local Advocis Society, Windsor Symphony, Windsor Western Hospital, Founding member of the Coalition-12 of Entrepreneurial Leaders, and Member of 100 Women Who Care. Stay up-to-date on what’s happening at the EPICentre. A collaboration between the Odette School of Business and the Office of Research & Innovation Services.